I've been programming in Scala for a while and I like it but one thing I'm annoyed by is the time it takes to compile programs. It's seems like a small thing but with Java I could make small changes to my program, click the run button in netbeans, and BOOM, it's running, and over time compiling in scala seems to consume a lot of time. I hear that with many large projects a scripting language becomes very important because of the time compiling takes, a need that I didn't see arising when I was using Java. But I'm coming from Java which as I understand it, is faster than any other compiled language, and is fast because of the reasons I switched to Scala(It's a very simple language). So I wanted to ask, can I make Scala compile faster and will scalac ever be as fast as javac. The Scala compiler is more sophisticated than Java's, providing type inference, implicit conversion, and a much more powerful type system. These features don't come for free, so I wouldn't expect scalac to ever be as fast as javac. This reflects a trade-off between the programmer doing the work and the compiler doing the work. That said, compile times have already improved noticeably going from Scala 2.7 to Scala 2.8, and I expect the improvements to continue now that the dust has settled on 2.8. This page documents some of the ongoing efforts and ideas to improve the performance of the Scala compiler. Martin Odersky provides much more detail in his answer. There are two aspects to the (lack of) speed for the Scala compiler. Scalac has to search the classpath for all root packages and files. Depending on the size of your classpath this can take one to three extra seconds. Overall, expect a startup overhead of scalac of 4-8 seconds, longer if you run it the first time so disk-caches are not filled. Scala's answer to startup overhead is to either use fsc or to do continuous building with sbt. IntelliJ needs to be configured to use either option, otherwise its overhead even for small files is unreasonably large. Slower compilation speed. Scalac manages about 500 up to 1000 lines/sec. Javac manages about 10 times that. There are several reasons for this. Type inference is costly, in particular if it involves implicit search. Scalac has to do type checking twice; once according to Scala's rules and a second time after erasure according to Java's rules. Besides type checking there are about 15 transformation steps to go from Scala to Java, which all take time. Scala typically generates many more classes per given file size than Java, in particular if functional idioms are heavily used. Bytecode generation and class writing takes time. On the other hand, a 1000 line Scala program might correspond to a 2-3K line Java program, so some of the slower speed when counted in lines per second has to balanced against more functionality per line. We are working on speed improvements (for instance by generating class files in parallel), but one cannot expect miracles on this front. Scalac will never be as fast as javac. I believe the solution will lie in compile servers like fsc in conjunction with good dependency analysis so that only the minimal set of files has to be recompiled. We are working on that, too. Naming conventions (a file XY.scala file need not contain a class called XY and may contain multiple top-level classes). The compiler may therefore have to search more source files to find a given class/trait/object identifier. The type system - the scala type system is way more complicated than Java's and hence takes more CPU time. scalac includes an 8-bit simulator of a fully armed and operational battle station, viewable using the magic key combination CTRL-ALT-F12 during the GenICode compilation phase. The best way to do Scala is with IDEA and SBT. Set up an elementary SBT project (which it'll do for you, if you like) and run it in automatic compile mode (command ~compile) and when you save your project, SBT will recompile it. You can also use the SBT plug-in for IDEA and attach an SBT action to each of your Run Configurations. The SBT plug-in also gives you an interactive SBT console within IDEA. Either way (SBT running externally or SBT plug-in), SBT stays running and thus all the classes used in building your project get "warmed up" and JIT-ed and the start-up overhead is eliminated. Additionally, SBT compiles only source files that need it. It is by far the most efficient way to build Scala programs. The latest revisions of Scala-IDE (Eclipse) are much better atmanaging incremental compilation. See "What’s the best Scala build system?" for more. 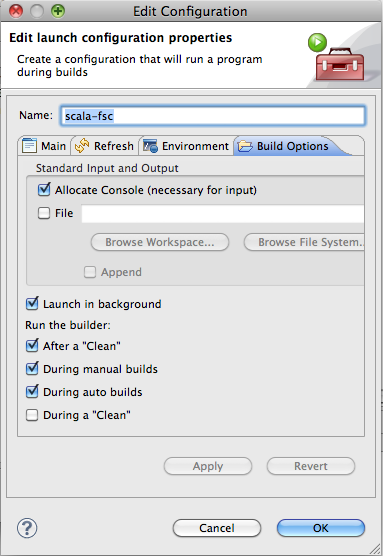 The other solution is to integrate fsc - Fast offline compiler for the Scala 2 language - (as illustrated in this blog post) as a builder in your IDE. You shouldn't be using FSC within Eclipse directly, if only because Eclipse is already using FSC under the surface. FSC is basically a thin layer on top of the resident compiler which is precisely the mechanism used by Eclipse to compile Scala projects. sbt (Simple build Tool) also include some kind of "incremental" compilation (through triggered execution), even though it is not perfect, and enhanced incremental compilation is in the work for the upcoming 0.9 sbt version. Use fsc - it is a fast scala compiler that sits as a background task and does not need loading all the time. It can reuse previous compiler instance. I'm not sure if Netbeans scala plugin supports fsc (documentation says so), but I couldn't make it work. Try nightly builds of the plugin. You can use the JRebel plugin which is free for Scala. So you can kind of "develop in the debugger" and JRebel would always reload the changed class on the spot. I read some statement somewhere by Martin Odersky himself where he is saying that the searches for implicits (the compiler must make sure there is not more than one single implicit for the same conversion to rule out ambiguities) can keep the compiler busy. So it might be a good idea to handle implicits with care. If it doesn't have to be 100% Scala, but also something similar, you might give Kotlin a try. I'm sure this will be down-voted, but extremely rapid turn-around is not always conducive to quality or productivity. Take time to think more carefully and execute fewer development micro-cycles. Good Scala code is denser and more essential (i.e., free from incidental details and complexity). It demands more thought and that takes time (at least at first). You can progress well with fewer code / test / debug cycles that are individually a little longer and still improve your productivity and the quality of your work. In short: Seek an optimum working pattern better suited to Scala. Not the answer you're looking for? Browse other questions tagged java performance scala compilation or ask your own question. What's the best Scala build system? What can I do to my scala code so it will compile faster? Why is compilation very slow for Scala programs? How expensive is type inference? Why does IntelliJ IDEA compile Scala so slowly? What is the 8-bit simulator in scala compiler and how to launch it?